The House was reputedly haunted by the Ghost of a 16-year-old Maidservant duly wronged by her Employer and who chose to drown herself and her shame in a Pond and makes re-appearances every 14 years or so. The Laird Craig Family members readily subscribe to this phenomena as a result of directly related experiences. Wing Commander A J Laird Craig’s Grave Lies in St Luke’s Churchyard, Gaddesby. The Gaddesby Hall of the 1940s was built on the Site of an earlier House originally known as Paske Hall. This was a Fortified Building surrounded by a Moat. Parts of the Building dated back to the 14th Century. This Hall was demolished in 1744 when the 2nd Hall was built. 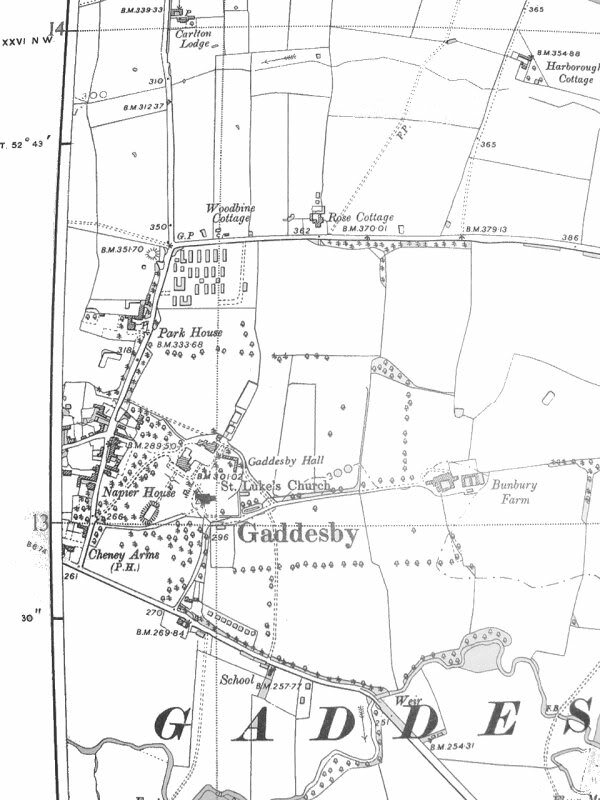 Gaddesby is located about 7 miles South-West of Melton Mowbray on the Rearsby to Tilton road. Originally given by Henry II to the Knights Templar, the Manor passed to the Knights Hospitallers in 1312. The Church and the Hall, which is still a Private House, can be seen across the Vista of Gaddesby Park which has unusual red brick herringbone drywalling. Over the centuries, the Hall had a number of Owners. As a ‘Troop Billet & Ordnance Depot‘ Gaddesby Hall suffered damage by American Forces during WW2 and was reduced in size and renovated in the 1950s (the Wings & Top-storey were demolished). 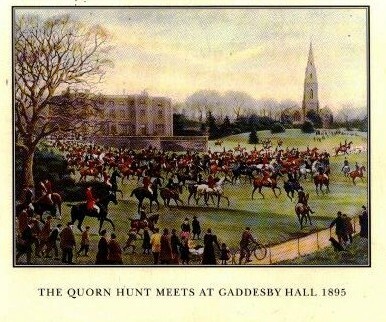 A Black Watch Regiment and later an American Regiment was based at Gaddesby (or Paske) Hall. As early as February 1941 the area surrounding Melton Mowbray had been Surveyed for suitable Ammunition Storage Sites, and a wooded area between Gaddesby & Great Dalby was proposed as being suitable. In fact, the Site was not used until July 1943 when it was accepted by the 8th Air Force Service Command as temporary Munition Stores capable of 21,000-tons capacity. The Site eventually became a Truck Storage Depot and was handed back to the Ministry of Supply on the 7th May 1946. The Hall, designated by the Americans as Camp Paske Hall, and was used as Headquarters for the Ordnance Depot 0-690 that was built up around it. The Site was selected for use as a Depot for Storage of Air Force Types of Ammunition on the recommendation of Maintenance Command RAF. It was their original intention, as mentioned in the Bolero Plan, to return this Depot to the RAF as soon as conditions warrant doing so. During that occupancy, estimated daily handling capacity of 500-tons per day, and a total Storage Capacity of 21,000-tons was to be maintained. On 26th September 1942, Col. McKay requested that Melton Mowbray be activated as an Ordnance Ammunition Depot; GO No.47, activating the Depot as O-690 with Lt Col Robert M Harris Commanding, was published 30th September 1942. The British Army released to the US Army, Paske Hall (Gaddesby Hall) and Manor House (Ashby Folville) for Billet & Headquarters, use Plans were later made to release (transfer) the Depot from Ordnance (US Army) to Air Force (8th United States Army Air Force, USAAF) final agreement being reached on 22nd June 1943. Request for inactivation of O-690 was made 02 July 1943. Consequently, the Depot was turned over to the USAAF on 15 July 1943 & designated AAF Station 520. Bomb Storage was on dunnage (battens) Roadside verges with some temporary Hutting for Pyrotechnics, Incendiary Bombs & Small Arms Ammunition (SAA). As with other Depots, a network of local minor Roads was utilised resulting in the Depot covering a large area with no central reference point. The single Railhead at Great Dalby Station was expanded with additional Sidings to accommodate Munitions Trains. This Station was conveniently central to the Depot area. AAF Station 520 Melton Mowbray was operated by the USAAF between 1942 & September 1945, Apart from being an Ordnance Depot, the Site was also home to a Training School known as the Aviation Ordnance School Centre. Established to “Train enlisted Men & Officers of all Air Forces in all Types of Ammunition”, it ran various courses for AAF Personnel including a Rocket Grenade Launcher School in late 1944. References to a “Bazooka School” there at around the time are probably referring to the same Course. It was easy to get lost. 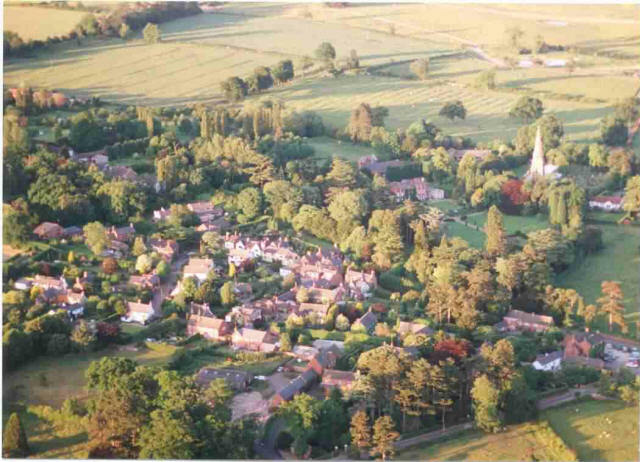 England was (and still is) a patchwork of Fields, Towns, & Villages, all looking remarkably similar from the Air. For Aircrew members accustomed to using a single Crossroads or Country Church as a Landmark, accurate Navigation became crucial. Even on the Ground, Crewmen travelling from place to place could find locations difficult in 1940, when a German Invasion appeared imminent, the British had removed practically all the Road Signs & Mile Markers. Indeed, Navigation became such a problem that a special “Pathfinder” School was established at RAF Alconbury (AAF-102), Huntingdonshire. The Echelons of the Royal Air Force, in order of ascending size, were Squadron, Wing, & Group, whereas the USAAF used the designations Squadron, Group, & Wing. This also explains the rationale behind the RAF System of Officer Ranks: Squadron Leader, Wing Commander, and Group Captain, respectively; each equivalent in Rank to Major, Lieutenant Colonel, & Colonel in the USAAF. Gaddesby Hall was built on the site of an earlier Fortified House called Paske Hall which was surrounded by a Moat and dated back to 1390. This Old Hall was pulled down in 1744 and the present Hall erected. The Houses in the Village formed part of the Estate of Gaddesby Hall. Over the years the Hall had several Owners including the Nedham, Ayre & Cheney Families – all of whom are commemorated in the adjacent Mediaeval St Luke’s Church. The Estate was put up for Sale in 1917 at which time the celebrated Statue of Colonel Cheney was moved into St. Luke’s. After suffering neglect and from its use by the American Armed Forces during WW2 the Hall was reduced in height and renovated during the 1950s. During the War, Wing Commander A J L Craig was madly punctual. Post RAF Sevice he felt he had spent so many years being ruled by the clock, he pretty much rejected being on time. The Family were as a result always embarrassingly late at St Luke’s Church Services in Gaddesby which meant walking the gauntlet of accusing eyes past the more punctual Congregation to reach the Front Pews allocated for the less timely Owners of Gaddesby Hall at the Choir Screen. Plaquecommemorating additional Peal Bells dedicated to A J Laird Craig, Donated by Hubert Ross-Wilson a retired Electrical Engineer. This Church is full of interest: the Architecture, the opulent Decoration of its South Aisle, the Ancient Woodwork – even the Rustic Floors – are all fascinating. So too are the Memorials, many of them are Slate, which dates from the Medieval Period through to the 20th century. 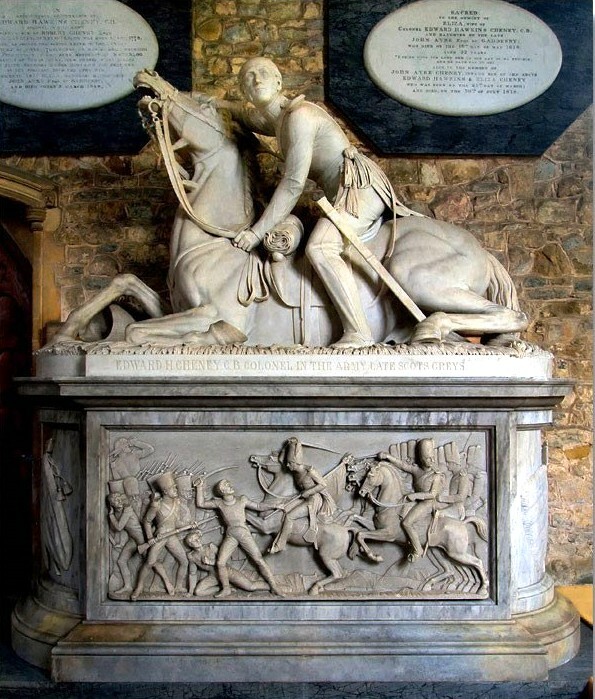 However, one 19th century Memorial is unique among those found in English Churches. The almost life-size Equestrian Statue of Colonel Edward Hawkins Cheney of the Royal Scots Greys was carved in 1848 by Joseph Gott. The Colonel fought at the Battle of Waterloo on 18th June 1815. He had 4 Horses killed from under him on that day, and the Command of the Regiment fell upon him when he was mounted on his 5th Steed. He is shown on a collapsing Horse that is dying from a bullet that has entered the front of its body below the bottom of the neck. The Panel on the Base of the Memorial shows Sergeant Ewart in hand-to-hand combat with a French Cavalry Officer, trying to recapture a lost Napoleonic Eagle Standard. Colonel Cheney married Eliza Ayre whose father owned Gaddesby Hall, and he inherited the Property on the death of his father-in-law. This Memorial was carved 3 years after the Colonel’s Death in 1845 and stood in the Conservatory of the Hall. However, when the Estate was sold in 1917. it was moved, on tree rollers, to St Luke’s, where it was placed in the Chancel, becoming the only Equestrian Statue to be found in an English Church. There is a story, probably apocryphal, that the Sculptor, after completing the Statue, realised he’d forgotten the horse’s tongue, and in despair, committed suicide. The Horse’s Teeth have been stained over time by the Apple placed in its mouth each year at the annual Harvest Festival. Lady Cecilia Katherine Wellesley (b.1913) was the daughter of Henry Arthur Mornington Wellesley, 3rd Earl Cowley & Clare Florence Mary Stapleton and was born in Chippenham, Wilts. She 1st married John Claude Smiley, son of Major Sir John Smiley, 2nd Bart & Valerie Champion de Crespigny, on 4 December 1936. The child of Lady Cecilia & John Claude Smiley was Major David Valerian Smiley b.1st April 1938. She and John Claude Smiley were divorced in 1942. Lady Cecilia Katherine Wellesley married again to Lt Col Norman David Melville Johnstone of the Grenadier Guards (SOE Italy) b.17th January 1911 (son of Charles Melville Johnstone) on 18th March 1942 and they had a child, Charles Edward Johnstone born on 19 September 1941 (During her 1st Marriage). She and Norman Johnstone were then divorced in 1950. In 1944 she was living at Gaddesby Hall, her Family Home, located about 5 miles from Melton Mowbray in Leicestershire. During WW2, the Hall had been seconded to the War Effort and was occupied by American Troops. The 31-year-old Lady Johnstone and a few 100 American USAAF men. The Hall would be both the HQ and the Aviation Ordnance School. The Hall became home to GIs during WW2 and during its Role in the War Effort, the Hall became the Centre of a Military Scandal. 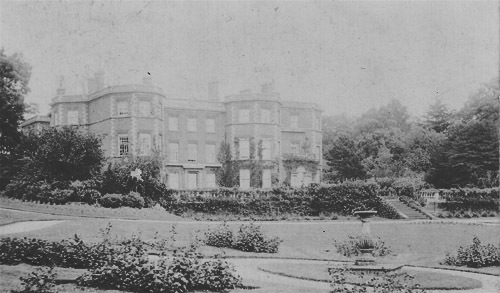 As the Leicester Chronicler Reports, Lady Cecilia Johnstone was living at the Hall – then her Family Home. In 1944 rumours were rife that Lady Cecilia and an unnamed female relative (her sister Lady Diana Mary Dixon – nee Wellesley) had been flown to Brussels for an Overnight Stay at the Hotel Metropole, Flying back to England on the following day, with an American Colonel using a Dakota Bomber. Police from London & Leicestershire questioned Lady Cecilia and a Report was forwarded to the Home Office. At the time, Reporters seeking Miss Johnstone’s Story were informed that she was unable for comment, her Solicitors having advised her not to discuss the allegations. After the initial investigation, Lady Cecilia had returned to her Leicestershire home. Nothing ever came of the allegations. The Hall was renovated and reduced in size soon afterwards and is still a Private Family home. At the time of the alleged incident, Germany was losing the War on all Fronts. In September 1944, as the Russians halted their advance on Warsaw and the Allies stalled in Holland in Operation Market-Garden. Hitler had amazed his Command with a bold plan. Panzer Divisions would smash through the weakly defended Ardennes and head for Antwerp, cutting off the Allied Supply Lines. Special English-speaking Units in modified German Armour and captured American Equipment would Range out ahead of the Panzers, causing confusion and creating fear among the Ranks. The Allies ignored the warnings of the German build-up. The Americans had only a few Divisions, including the 106th Division, in the Ardennes guarding a 50-mile Front. The area was used to Rest & Refit Divisions coming off the Line or to organise new Units. The Germans poured 14 Infantry Divisions & 5 Panzer Divisions into this Front, smashing the new 106th Division out of existence. 7,500 men surrendered in the largest Mass Surrender in US History. This then was the Military background that contrived the alleged Flight by Lady Cecilia Johnstone (in an American Dakota Aircraft) of such intense interest to Allied intelligence. Two Titled Sisters who took a Joy-Ride to Belgium with an American Colonel in a USAAF Dakota Aircraft have been fined £50 each with £10/10/- costs. They are Lady Cecilia Katherine Johnstone (She was the daughter of Countess Cowley and half-sister of Earl Cowley) & Lady Diana Mary Dixon, daughter of the Earl of Cowley. Lady Johnstone said that they were flown to Brussels, by an American, Colonel Myer. The Plane also carried a Jeep in which they motored to Brussels, where they bought 2 bottles of Scent & Toys for the Children. She said that they were unable to Fly back the same day because the weather was too bad. She & her Sister shared a Room at the Hotel Metropole, which was arranged by Colonel Myer. They did not Sign the Register and flew back the next day. She added she was a member of the Women’s Voluntary Services and was Associated with a Club providing Hospitality for Americans in Britain. Lady Dixon was dressed in the uniform of the Red Cross. Colonel Myer, it was stated, had to return to America. Before going he told the Police that the fault was entirely his. Billeting Facilities: With reference to the Housing at the Depot, Colonel McKay advised HQ Maintenance Command (RAF) that Ordnance (US Army) would not require the Construction of any Quarters for Personnel, Field Office, or similar Structures. 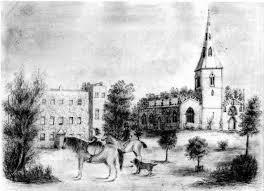 In accordance with our understanding with the War Office, the British Army released to the US Army Paske Hall (Gaddesby Hall) & Manor House (Ashby Folville) for Billet & Headquarters use. Referring to Billeting (above), either the US Army intended to build their own Accommodation or Hutting had already been erected by the British Army. Gaddesby Hall (which the US Army referred to by the old name of Paske Hall) was taken over as the Depot Headquarters. A Nissen Hutted Accommodation Camp was situated behind to the North West. The Manor House at Ashby Folville was taken over as Accommodation for Black Troops and it too had a Nissen Hutted Camp. Such was Wartime Segregation in the USAAF. Ashby Folville Manor is a late 19th-century house in Neo-Tudor style in the Village of Ashby Folville, Leicestershire, where The Duke of Windsor 1st met Mrs Simpson, at a House Party given by the Smith-Carrington’s. It is only a short distance from Gaddesby – Wing Commander John Smith-Carrington, a decedent of the Family who were the Lords of the Manor in the 16th Century, inherited the Ashby Folville Estate, which extended to approximately 1200 acres, just after WW2. By a remarkable coincidence Lady Cecilia’s only great grandson Patrick Valerian Smiley married, at her home Gaddesby Hall, Arabella Faith Chapman in 2001. Arabella is the daughter of Mrs Valerie Jinks and the late Brian Chapman. Patrick & Arabella met when Patrick’s father, David Valerian Smiley, Lady Cecilia’s only son, was staying at Gaddesby Hall as a Guest while attending a Family Wedding at the Colonel Johnstone’s Home Park House in Gaddesby. 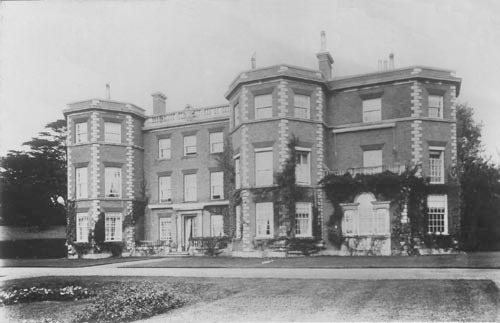 Gaddesby Hall had been home to Arabella since the remarriage of her Widowed mother Valerie Chapman (also nee Chapman) to Industrialist Mr David Jinks. When the Mr and Mrs Jinks purchased Gaddesby Hall it was very run down. Over 35 years they have restored the House and Grounds. The accolade for the Gardens was a 10 page feature in the Centenary Edition of Country Life Magazine. Mrs Jinks is the daughter of the Leicestershire landowner Frederick S Chapman who had considerable Estates in the County now owned by his grandchildren including Arabella Smiley, Giles & Henry Chapman. So the Leicestershire connection with Gaddesby Hall and Lady Cecilia is still much in evidence.